Bellissima Unisex Hair and Beauty is a contemporary salon based in Sunbury-on-Thames specializing in modern, contemporary and classic hair cuts and the latest colour collections using Fudge, Wella and L’Oreal products. We have a friendly and professional team for both men and women. 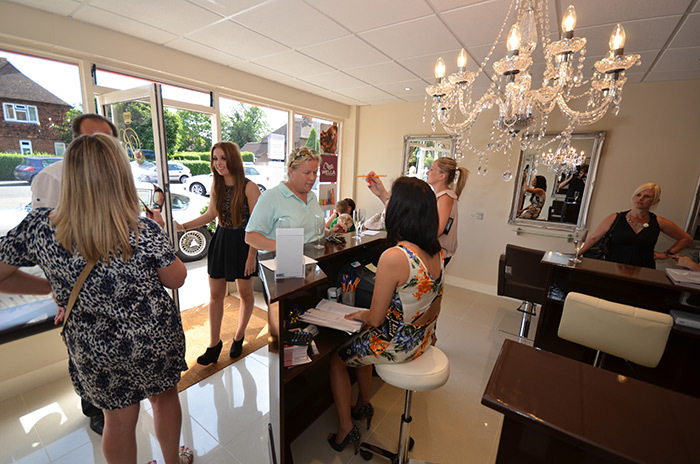 Bellissima is an independent unisex salon, owned and managed by Louise. Having achieved a wealth of experience with leading hairstylists, hair care and colour brands, Louise takes great pride in listening to client’s needs and has built up a very loyal customer base. Equally active in salon team development, excellent customer service is at the heart of Bellissima’s ethos and ensuring at all times every client feels relaxed, served well and leaves her salon feeling 100% satisfied. Bellissima offer a full and varied range of treatments to suit everyone’s needs. All our staff are fully qualified and we use only salon professional brands that give us the assurance and confidence to deliver the best possible results for all our clients. In fact, we like our products so much we use them on our own hair! We offer a full range of beauty treatments, including a nail bar offering manicures, pedicures and bio sculpture gel. Ask us about our wedding packages and specials – we usually have a great offer for our clients. Bellissima Unisex Hair and Beauty also offer a generous 20% discount for all new clients and their first appointment with us for hair and beauty treatments. Do you work for the NHS? We also offer a generous 10% discount for all hair and beauty treatments (proof will be required when you attend your salon appointment). For a free hair consultation, to book an appointment or make an enquiry please call us on 01932 953181 or click HERE to make an online booking.